Nicholas Hilliard was born into the prosperous trading classes, the son of a goldsmith. By 1572 he had begun to work for Queen Elizabeth I. This self-portrait marks Hilliard's first encounter with the Renaissance ideal of the artist as an individual of genius. 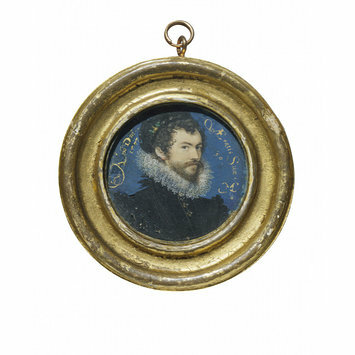 Dating from Hilliard's visit to France in 1576-1578, its mood is very much that of the portraiture of the art-loving French court, where artists enjoyed a far higher status than their English counterparts. Its boldness and brilliance demand recognition of Hilliard’s genius, and express his aspirations to the status of a gentleman, not a tradesman. The reality on Hilliard's return to England was less ideal. A permanent position at court with all its attendant privileges eluded him, and he was compelled to set up as an artist in the City of London like any other craftsman. Portrait of a young man, head and shoulders, turned slightly to right and looking to front; the sitter is wearing a black cap and a ruff; inscriptions in gold on either side of the portrait on a blue background. The painting set in a gold circular frame with raised concentric circles. Provenance: This or both this and the one of Richard Hilliard (no. 48) [P.154-1910] are referred to in the will of Laurence Hilliard dated February 21st 1640 bequeathing to his son, Thomas, “by way of Leagacey my gran Father(s) (pic) Hillyard his picture in an ivrey box with a Cristall vpponst” (Auerbach , Hilliard, p. 227) this originally read “my Fathars pic” and was altered to “my gran Fathar”; both are next referred to by de Piles in 1706 when in the possession of Simon Fanshaw: “There are moreover, two wonderful pieces of his, now in the Possession of Simon Fanshaw, Esq; and by him valu’d, nor without reason, as ‘tis the opinion of some good Judges, at above 50 Guineas each, tho’ not much bigger than a Crown-Piece. One of these is the Picture of our Artist himself, with this / inscription in Gold Letters round it. / Nicolaus… / The other is the Picture of his Father…These two pictures in Miniature are so Masterly done, that not only the Faces are finely colour’d an naturally with a good Rilievo; but that almost each single Hair is express’d.” (De Piles, The Art of Painting, London 1706, pp. 430-31 and Vertue. Notebooks, II, p. 129); both were acquired by John Sidney, 6th Earl of Leicester (1680-1737) and passed on his death to his brother Jocelyn Sidney, 7th and last Earl of Leicester (d. 1743); these facts are recorded by Vertue when he saw them at Leicester House in 1735 and in addition he records: “the writeing round these two pictures and the gilt mettal Frames first made for them was taken away and the two pictures sett in a gold Snuff box – by the present Earl of Leicester who had them from his Brother. but I wish them to be returned into their old Frames again” (Vertue, Notebooks, IV, p. 80); Walpole records that the Earl of Leicester gave the snuff box to Field-Marshal Sir Robert Rich, Bt, (Anecdotes of Painting in England, London, 1782, ed, I, p. 257 note); descended from Sir Robert Rich, 4th Bt, (1685-1768) to his son, Lt- General Sir Robt Rich, 5th Bt, (1714-85); they passed from him to a Mrs Clavering who gave them to her niece, Caroline Elizabeth (d. 1890), eldest daughter of George, 5th Viscount Barrington, in 1843 on her marriage to the Hon Thomas Liddell; she, in turn, gave them to her niece, Mary Frances (d. 1913), daughter of William, 6th Viscount Barrington, and wife of Alfred Sartoris; she sold them at Christie’s 27th June 1906 (lot 76); bt, Hodgkins; acquired by George Salting and bequeathed by him with his collection to the V&A, 1910. 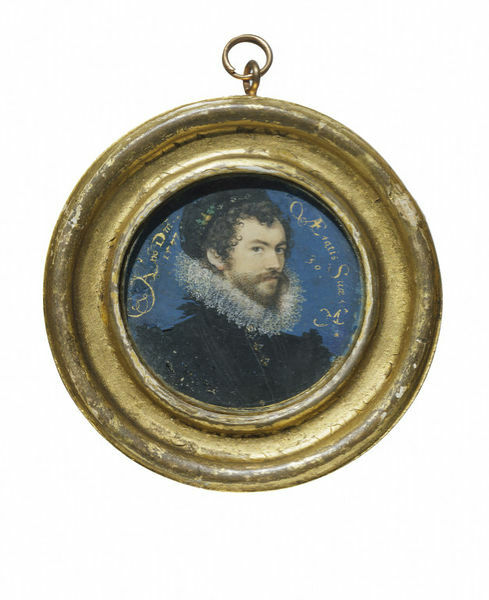 Miniature self-portrait of Nicholas Hilliard, watercolour on vellum, 1577. In England painters such as Hilliard were treated as mere tradespeople. But this confident self-portrait was painted during Hilliard's two years in France, where painters had a higher social status. Painted when the artist was in France.